I will NOT gloat. I will NOT brag. I am well aware that the success we enjoyed on our vacation to Disney World was an absolute crap shoot. It could have easily gone awry. It could have been filled with tears and tantrums, snot and sass. We somehow dodged the bullet and had an amazing time. O was unbelievably good. He rolled with everything. I am still amazed. He exceeded any expectations I had (although, as you know, I kept them very low.). It was absolute joy and we can’t wait to go again. Let the countdown begin! Again! So since I can’t complain about my child’s behavior on our trip, let me let loose on a real parenting fail we witnessed whilst in the happiest place on earth. Its unfortunate to see. You think, wait, this is a place for family vacations and being together, right? I suppose there are all types of families and all types of a-holes. We were enjoying the zero entry pool at the Animal Kingdom Lodge one day and this little girl decided to attach herself to us. She was British and very chatty. She was 5 years old. I looked around to see where her parent or parents might be? Strange to see a 5 year old on her own in the huge pool. She clearly could not swim, though she protested she could. Her attendance to us became a little awkward as she started to hang on my husband while he was holding O to swim. I told her it wasn’t safe for her to jump on anyone in the pool. She then waded back to where she could stand on her own. A woman appeared, who I assumed was her mother. The woman told the little girl to watch her little brother. And off the woman went. To the bar. In fact, the whole table of “adults” from that “family” were sat out of good view from the children in the pool. Now little Chatty Cathy is in the pool again hanging around us while her 3 year old brother wades in shallower water. He had swimmies on his arms, but really? 3!!! Alone in the pool with a bunch of strangers and his barely treading water 5 year old sister! Mind you, this pool is HUGE. I asked Chatty where her parents were. She pointed to the bar area, “over there somewhere.” What the heck, people! Are you kidding me? You don’t leave children (5 & 3) in the hotel pool by themselves. Are you complete idiots? As a parent, are you thinking, “Well, someone will watch them.” ??? Like the parents who are actually IN the pool with their kids. Like us? Listen, I get that we ALL NEED a vacation. I get that we are ALL in vacation mode. But just because you are in Disney World doesn’t mean bad things don’t happen to kids there. AND…you don’t get to take a vacation from your kids in Disney World. If you wanted alone time, you should have left them at home and went to some adults only all-inclusive where the drinks are free, as clearly that is where your head is at. As parents we don’t get to take a respite from our duties of caring for the well being of our children. It’s a 24/7 job. Sorry. Even on vacation. And this isn’t about letting your children be free and not helicopter parenting…..this is about safety and, I don’t know, maybe spending some quality time with your children! Who am I to say, right? And, yes, it certainly does takes a village. But when the parents vacate the village for the local watering hole, leaving their young to latch on to just anyone, it really pisses this villager off. If you don’t understand the incredible privilege you have to be a parent, then you certainly won’t understand my point. We GET to be their protectors! It may feel like a job some days, but make no mistake, it is a special opportunity, not enjoyed by everyone. It is my humble opinion, that if you piss away that time (yes, I just said piss away), you are a fool. End of rant. This entry was posted in Day to Day Survival, Wise Words? 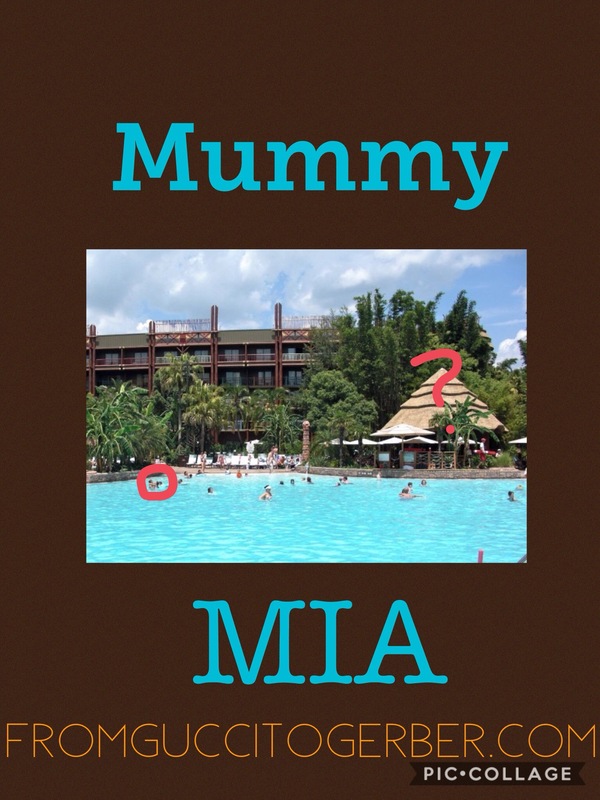 and tagged Disney World, editorial, mommy, mommy blog, motherhood, parenting, pool safety, safety, vacation. As women we are no strangers to the idea of “having it all.” As far back as I can remember, the notion was embedded into my head. You are taught from a very young age that if you aren’t looking to “have it all,” then you aren’t reaching high enough. Especially for us Type As. It is the female goal. Having it ALL. Great career, loving spouse, and of course, a baby or two ( or in some cases three or more…God Bless Ya!). Our society bills this as the ideal. As the way to happiness. Career Mommy who is fulfilled as a mother and a professional. Well …I say it’s all bananas. So I have to personalize the theory. If I try to keep my career going, then I have to give up not just time with my son, but I would have to give up possibly, seeing his first steps, hearing his first words, among other milestones. For me to work, means time away. Sure I could bring him with me, but someone else would have to care for him during rehearsals and performance times….and then my husband loses out. He would miss stuff as well. How could I do that to him? So the loving husband is penalized for my need to feel relevant in my career. If I left O with my husband, he would be in daycare every week day. Again, someone else essentially raising my son. And I would miss everything. The mere thought of not seeing him everyday for even a small period of time is unthinkable right now. Maybe that will change? I don’t know. Either way, would keeping my career afloat bring me true happiness? Or just fleeting happiness? What is really required for true happiness? Well, I’m glad you asked that. Mr. Manson says that first off “you must accept imperfection and flaws.” Now this is tough because we then have to accept that we have to live with things we don’t like. I don’t like 4am feedings. I don’t like getting spit up on. And I don’t like the inconsolable crying. But…I accept it as where we are right now in this journey of raising our child. Hell, Ladies, there are about a hundred other things I don’t like about this job, but there are a hundred and four that I now can’t live without. Most importantly, Mr. Manson talks about finding a deeper purpose to your actions. This has to do with growth and contribution. Now THIS speaks to me as a mother. What could be more motivating than raising a child to become a decent, kind, thinking human being?? That is a true contribution to society. Hell, you could be raising the child who grows up to change life, as the world knows it, for the better! And as far as growth, well, that which doesn’t kill us makes us stronger…there’s your growth! But truly, I somehow understand through all my foibles with this task, that my love for O makes me a better person. It’s not about me. Mothering is a selfless act. And when you do for another, with no thought of gain for yourself, it makes you happy. It’s just the way it works. A pic from the last show I did before O. So the question is…could I find that profound happiness whilst belting out a tune or tapping my troubles away?? Happy, yes. But profound happiness?…the stuff of angels? No, I don’t think so. Don’t get me wrong. It’s not so easy. Not so black and white. There are days when I long for the smell of the greasepaint and the roar of the crowd. Days where I wish I could audition, book a show..and PLAY!! But….then the reality for this Mommy sets in. I know there are friends of mine and readers, perhaps, who are thinking that I am giving up. They are right. I guess, I feel I must to get something else, i.e. the “motherhood experience.” You see, I have enjoyed a rather full amazing life so far. One so completely different from the one I struggle through today. But there is part of me that knows there is a higher purpose to this time and task, and it honestly gets me through days when I don’t really want to go to “work.” (Like it’s an option! lol) So for now…my career suffers. Maybe it will never recover…maybe I will recreate myself as an older more grounded actress…?? ( I’m thinking Meryl Streep meets Kristen Wiig) ? Who knows… Who cares? Right now, it doesn’t matter. Right now, I need to BE HERE..in this moment. In this very special role, that was chosen just for me. And the HAPPINESS, while mingled with tears and tough days, is rich and abundant, and unlike any I’ve know before. This entry was posted in Day to Day Survival, Wise Words? and tagged career, editorial, happiness, having it all, motherhood, mothering, raising children, stay at home mom.